To read a brief description of each workshop, simply click on the title of the workshop listed below in the embedded calendar. You can register for the workshop at the bottom of the description as well. Sign Up for a Seminar/ Workshop! 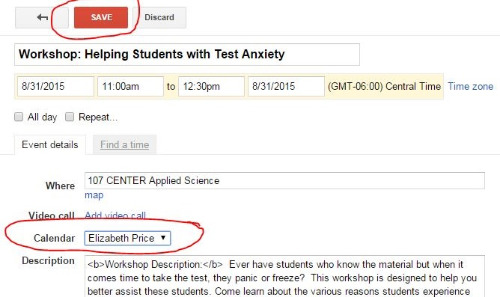 How can I add workshops to my Google or Outlook calendar? If you register for one of our workshops, it's easy to then add it to your own Google calendar. 1. Click on the name of the workshop you registered to attend. 2. Once the description opens, find Copy to my calendar. 3. Make sure the correct calendar is showing. Then click Save. Do you use Outlook instead of Google Calendar? This article shows how you can have your Google Calendar events show up in Outlook.